Just when I started to get back into my former blogging habits, last week happened. Mike and I spent last weekend prepping for the hurricane– making sure our new generator worked and had gas, stocking up on food, picking up prescriptions for the cats. We felt pretty prepared and so, we picked up some paint and started working on our project for Young House Love’s seasonal Pinterest Challenge. We also spent some time last weekend at our neighborhood Halloween party. 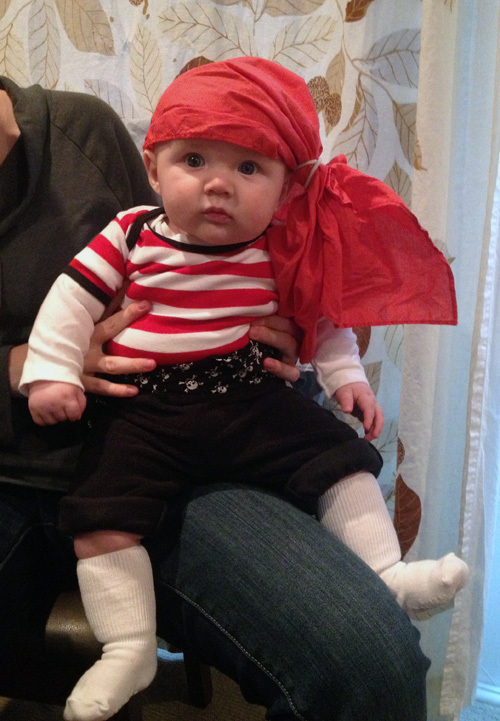 Easton was a pirate. We planned to post about our Pinterest Challenge project on Monday night, but our power went out at 4:30. Oh yes, those bookcases live on. Mike finally gave them the caulk and paint they deserve. Some areas still need another coat, so we’re not ready for after pictures yet. 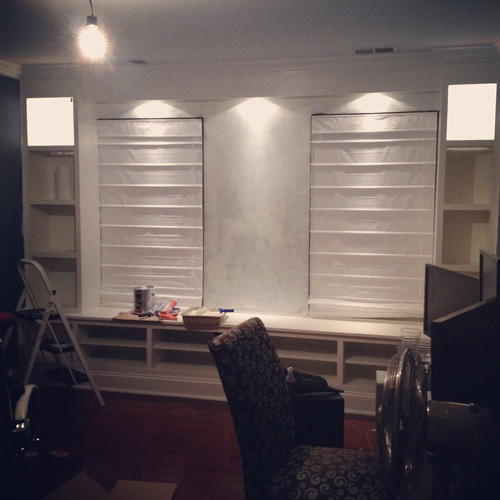 Oh and the wall is covered in primer because… we decided to change the color of the room too. Once our power was out, we surrendered and put down the paint brushes. After Irene last year, we were more prepared this year with a small generator, flashlights and candles. We also set up a pack ‘n play in our formal living room, which is on the main floor, towards the front of the house (away from the tall trees in the backyard) and kept Easton as far away from windows as we could. We closed all of the bedroom doors upstairs to keep the cats from hiding up there incase a tree fell or we had a tornado warning. During Irene, I barely slept all night because the wind, sirens and transformers exploding were terrifying. We knew Sandy was expected to be much worse for New Jersey. Once the storm started to get bad, Mike herded the cats into the former office/soon to be playroom. We wanted to make sure that if something happened to the house, or we had to make a run for it, we knew where to find them. Easton slept in his pack ‘n play and I slept next to him. I was blasting his white noise machine (which runs on battery) so I slept for a few hours. Thanks to social media, we were very aware of how things were going around the state all night. We were able to keep our iPhones charged thanks to our generator. Once it was daylight and the pictures started popping up in our Facebook newsfeeds, we were in shock. Our yard was covered in leaves and branches, but our basement stayed dry this time. We were very, very lucky. Our power was only out for a day– less time than it was with Hurricane Irene last year. At one point we were told it would take a week, so we were so excited when it came back on so quickly. We had Easton all bundled and sleeping with us for just a day, since it was cold and we had no baby monitor. Our hearts break for those who weren’t so lucky. And there are so so many of them. My parents are still without power and the area I grew up in was hit pretty hard. New Jersey is a small state, so it seems that we know people in every badly affected area. 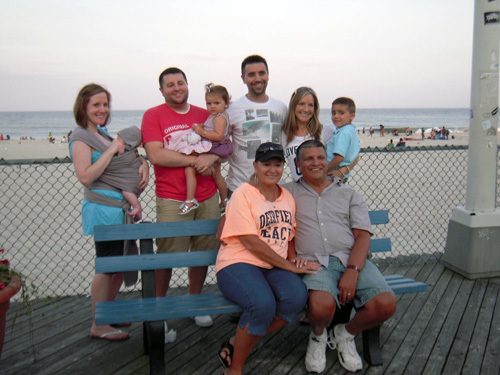 My family is originally from Hoboken and I still have family there, Mike is from Staten Island and still has family there, we have friends down the shore everywhere and we spent time with Easton in Manasquan and Seaside this summer. If you haven’t seen pictures of Seaside, that boardwalk is not even there anymore. Once we got power back I watched the Weather Channel for 3 days straight. We spent much of the remainder of the week hosting some family that didn’t have power and needed hot meals and showers. It seemed wrong to post about superficial things, particularly our house, when so many people close to home (literally and figuratively) are suffering. We also planned a road trip to attend the Young House Love book signing in Connecticut on Friday, but because of gas shortages and traffic getting into NYC (which we’d have to cut through), we decided not to go. Everything was sort of put on hold last week, including my job, which was without power all week. Seeing familiar areas destroyed really put everything in perspective. So glad that you guys were safe and didn’t have any damage at your house! So darn scary. And so sad to see the devastation. I just sent two huge boxes of brand new socks, gloves, mittens and scarves to Socks for Sandy. I just wanted to do something more than a monetary donation. A blogger came up with the idea, and I think she will be surprised on the over wehlming support she has gotten from everyone. If there is anything that you think could help make this transition of getting back on their feet for the victims, please please let us know. So glad you guys are safe. I’m glad you guys made it through okay. Hurricanes are terrifying. I grew up in Louisiana, I have family in New Orleans that went through Katrina, and my parents got hit by Rita and had major damage to their house ( a tree fell on it). I really hope your area gets rebuilt faster than New Orleans. The storm was definitely terrifying. I couldn’t really sleep the night of the storm. The crazy winds and stuff hitting the house had me totally freaked out. I’m so thankful we didn’t have any major damage and that the worst thing we had to deal with was no power for a week. I can’t believe you guys got power back after one day…that’s awesome!! Our heart definitely breaks for everyone who was touched by Sandy. It’s so crazy to think of all the devastation it caused! !